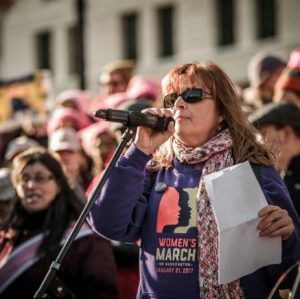 Animal rights at the Women’s march in Albany, NY? Yes. Because females of all species are discriminated against. After I attended the Women’s march in DC in 2017, I felt a huge pull to combine my veganism with women’s rights. I heard about my friend, LJ in Philly who had started a Vegan Lady Gang and I asked her about it. LJ founded the VLG in 2015 as a group of amazing vegan women all who are making the world a better place for animals and for each other. It sounded like a perfect fit so I formed the Albany Vegan Lady Gang! Our groups on facebook are secret, though the Vegan Lady Gangs are not, to keep trolls out and to maintain a safe space for women to share, support, and uplift one another. There are currently 13 VLG that have formed! This year, there were Women’s marches being planned again. I decided to stay local and participate in Albany’s Women’s march. I saw a call-out for women’s groups to sponsor and help organize the Albany Women’s march. I jumped on the opportunity to bring the Albany Vegan Lady Gang to the Albany Women’s march! The organizers were seeking a final speaker and I had a perfect candidate in mind: Kathy Stevens, Founder and Executive Director of Catskill Animal Sanctuary and an animal & women’s rights advocate. I contacted Kathy and she agreed to be speaker. 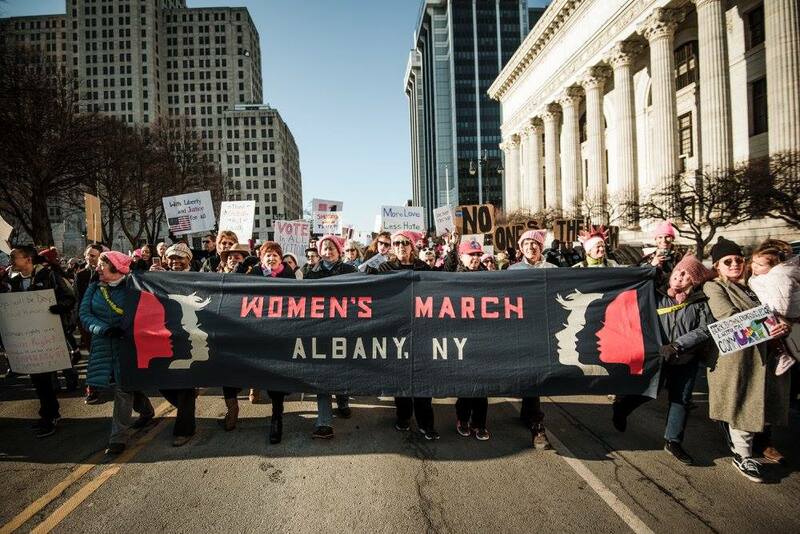 The morning of the Albany Women’s March, Kathy called me a few hours before the march. There had been an emergency with someone near and dear to her and she felt she needed to be with them, and I whole heartedly agreed. She was unable to fill her speaking slot on such short notice. Kathy and I had spoke the night before and she had read her speech to me. I knew and felt with every fiber in my being that her message for the animals needed to be heard. Out of nowhere, I heard myself ask Kathy if she trusted me to deliver her speech, that I would be honored to! I was a shy kid in school and could barely answer questions in a classroom of 20 students, how was I going to give a 4 minute speech in front of 4,000?!? With Kathy’s blessing and trust, she emailed her speech to me and off to the Albany Women’s March I went! I found some of the members of the Albany Vegan Lady Gang and told them that Kathy was unable to attend but entrusted me to deliver her powerful words. I then went to find the co-organizers of the march to inform them that I was filling in for Kathy. “Sojourner Truth, Susan B. Anthony, Cesar Chavez, Mother Jones, Rosa Parks, Harvey Milk, Bayard Rustin, Dr. Martin Luther King, JR and Coretta Scott King, Gloria Steinem, are a few of the courageous leaders whose vision of a world of opportunity and the right of ALL to pursue joy inspires us to work for that same breathtaking vision-the day when all can know opportunity, all can walk the streets unafraid of police brutality or the halls of their workplace unafraid of sexual aggression. The millions who march around the nation today, and the movements we care about, share a concern for the oppressed among us. We hold in our hearts the vision of that blessed day when each of us honors the other, and the fragile planet we share. Something SO SIMPLE brings us all together in this work: OUR KINDNESS. And yet at ALL the marches and in ALL the cities among ALL of those raising their voices to insist on that new day, we ignore the most enslaved. The most abused. The most invisible. We are ignoring the only ones who have no voice-or at least not the one that most of us are willing to hear. The ones whose suffering makes the worst I could experience seem small. Those whose lives are nothing but terror, torture, and suffering, laden with one injustice after another, from birth until the moment of their grizzly death, when at least they finally have peace. I’m speaking, of course, about the animals. Dairy cows are shackled, forcibly impregnated, but have their children stolen from them so that we humans can drink the milk intended for their babies. There is not such thing as a “milk cow”-woman make milk when they are pregnant. Cows make milk when they are pregnant. It is for their babies. But their babies are stolen from them immediately after birth. They cry for their mothers-in terror, confusion, loneliness. And the mothers cry for them. Year after year, calf after stolen calf. The industry is so difficult on the mothers that their milk production tapers off after only a few short years-and our thanks for their servitude is that we kill them. This is just a tiny peek into a single part of a single industry. Around the country at this dark and dangerous time, good people of conscience are organizing against the exploiting few whose unbridled greed trumps every value humanity holds dear. We are saying “No.” We march and speak out against this vile administration, we speak out against our oppressors, and yet we, too, exploit every time we sit down and consume part of a being who-if I know anything, I know this, having rescued and worked with and lived among and loved over 4,000 farm animals-want their lives every bit as much as you and I want ours. Honor the values that brought you here today: Kindness. Compassion. Mercy. Justice. Love. People cheered when I first began the speech and also when I mentioned the animals but there was a heavy silence I felt within the crowd as I spoke Kathy’s words about dairy cows. When I closed the speech with her words about extending our arms to include the animals, there was a huge roar through the crowd. I am deeply honored that Kathy entrusted me with her words-I still can’t believe I did it! The animals had a voice at the Women’s March in Albany, NY!